The arrival of 20 new recycling collection vehicles at Teignbridge District Council marks the commencement of a three phase roll-out of its weekly recycling collection service. Specialist Fleet Services Ltd (SFS) has supplied the vehicles, all Romaquip Kerb-Sort, as part of its contract with the authority, which was renewed on 1 April 2015. The seven-year agreement involves the provision and maintenance of 65 vehicles in total for the council’s recycling, cleansing, environmental enforcement and animal welfare services. The Kerb-Sort can accommodate a wide range of materials stored into individual enclosed compartments, including paper, cardboard, mixed plastics, glass, textiles, batteries and food. The design of the vehicle ensures that the quality and suitability of each material is maintained for onward recycling. It is also fuel-efficient and can be operated with a minimum of one driver and one loader if required. 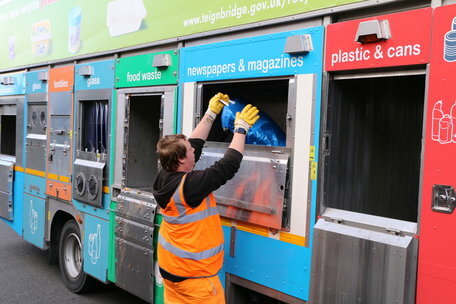 Teignbridge began the switch from fortnightly to weekly collections in September this year to increase the amount of recycling collected from homes. Food waste, mixed plastic packaging and all types of cardboard have been added to the existing service and there is an optional charge to collect garden waste. At the end of the third phase of the roll-out, in November 2015, some 60,000 homes will be having their recycling collected on a weekly basis.